*We were provided with this product for our review and any opinions are 100% our own. Lately life has been pretty non-stop with growing twin babies, a busy middle schooler, and a little man that is running 100 miles an hour at all times. When life gets hectic, I want nothing more than a relaxing night in. You? 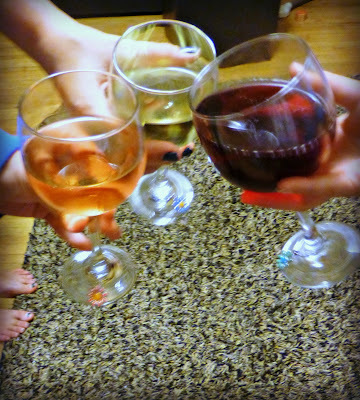 A Midwest Mammas Night In was planned and Refresh by Turning Leaf helped us relax and unwind. I tried Refresh by Turning Leaf while I was at BlogHer13 in Chicago. Yes, I did make myself cozy at their booth, but how could you not when the ladies were so fantastically friendly and the beverages were so refreshingly delicious! When my delivery of Refresh by Turning Leaf showed up, it took everything in me not to crack a bottle open and pour a glass. Okay, I may have snuck a glass of Pink Moscato during a Grey’s Anatomy episode, but that is justifiable. It was Grey’s. Refresh by Turning Leaf Pink Mostaco offers aromas of Mandarin oranges with notes of cherry, raspberry and pomegranate in this refreshingly vibrant wine. Great to pair with lights snacks like cheese plates and fresh fruit, as well as with meals like pizza and salads. We paired this with Bacon Cheddar Cheese and Sharp Cheddar Cheese on top of pretzel bread crackers. It really was the perfect combination of yum! Refresh by Turning Leaf Red Moscato offers peach and floral notes with layers of fresh red fruits and a crisp finish. Great to pair with backyard bbq foods like burgers and ribs, but we paired it with spaghetti and breadsticks. It was raining all day, which makes grilling out no fun, and hanging in the kitchen with my ladies and a pot of boiling water makes for great gab time. Refresh by Turning Leaf Crisp White offers the flavor of ripe golden delicious apple and lemon citrus. Savor the fruity flavors while enjoying the refreshing fizz. Great to pair with savory foods, roasted chicken, and even your favorite pizza. We paired it with a vegetable pizza that is one of my favorite appetizers! Easy to make and easy to eat it all, especially when one of my bestest girlfriends makes it! 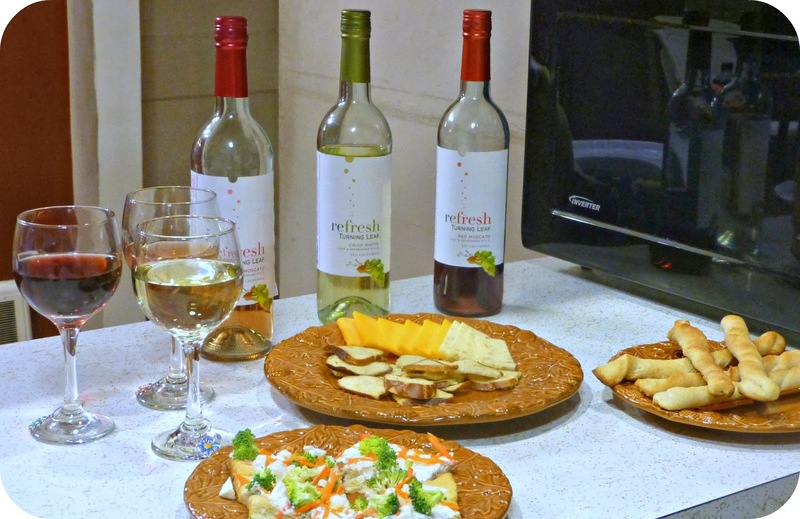 Give Refresh by Turning Leaf a try for your next ladies night in! You won’t be disappointed!